Item description: Pictorial envelope, “Hatteras A Blow for the Union,” manufactured by Reagles & Co. (New York), [between 1861 and 1865]. 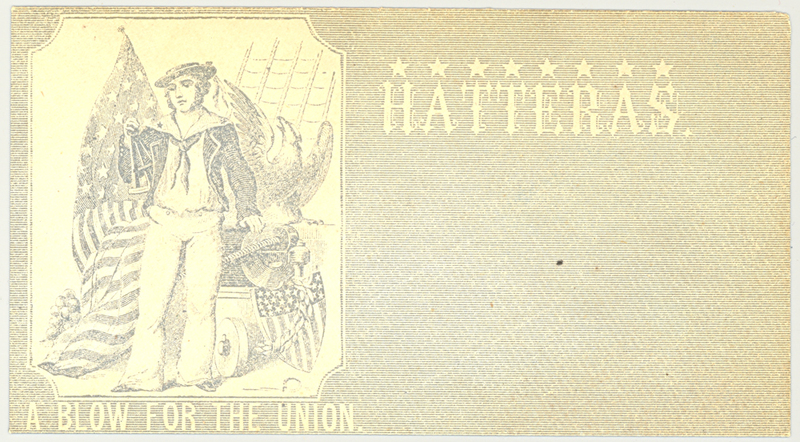 This envelope commemorated the Union victory at the Battle of Hatteras Inlet. Item citation: Envelope, from catalog #VCC970.7 C58, Cotten Collection, North Carolina Collection, Wilson Library, University of North Carolina at Chapel Hill. On August 26, a joint army and navy expedition (led by Maj. Gen. Benjamin Butler and Flag-Officer Silas Stringham), set sail from Fort Monroe to capture Hatteras Inlet. The expedition was aimed at strengthening the Union blockade of the Confederate coastline. To this point in the war, Hatteras Inlet had been an important haven for blockade-runners. On the 28th, while the navy bombarded Forts Clark and Hatteras, Union troops came ashore and attacked the rear of the Confederate batteries. On August 29, Col. William F. Martin surrendered the Confederate garrison of 670 soldiers. The Federals lost only one man. Butler returned to Fort Monroe, leaving the captured forts garrisoned. Although a minor engagement, the battle was the first significant Union victory of the war. This entry was posted in North Carolina Collection and tagged Battle of Hatteras Inlet, covers, envelopes, Hatteras, Hatteras inlet, Hatteras Island, illustrations, New York, pictorial envelopes, Reagles & Co.. Bookmark the permalink.